A word from Venus (Crystal Guide) describing the metaphysical properties of quartz crystals. While the crystal configurations and shapes which have been named by many are a good way to generally categorize these configurations, it can be misleading, because people may think that if a shape or structure implies this or that (via the name or description), that magically, simply by obtaining one of these specially named crystals, the desired outcome will be achieved. There are a LOT of different crystal configurations from which to choose. I'm not talking about different KINDS of crystals (such as amethyst, rose quartz, etc) I'm talking about only the different TYPES of clear quartz crystal here. Specifically, the different shapes in which it presents, each with slightly different metaphysical and healing energetic properties. Shapes, such as Barnacle, Bridge, Double Terminated, Extra-Terrestrial, Faden and Growth Interference, just to name a few. I've written a series of 4 books with drawings of each type, and in those, I covered forty-six different types. FORTY SIX! And those are just the most commonly found... there are actually a few more! With that in mind, let’s talk again about how these metaphysical characteristics work. I've written about this before, but it bears repeating in case you missed the earlier blog posts. GENN'S NEW BOOK IS FINISHED ! CRYSTAL MANDALAS: Anatomy & Physiology of Quartz Crystals (Volumes 1 - 4) COLORING BOOKS ! I've been working on this series for a couple of years now, and of course, all my friends, when they saw the great hullaballoo about the "adult coloring books", were on me to "HURRY HURRY HURRY, Genn!! Get your book out!" Well, while I agreed that "striking while the iron was hot" seemed the smart thing to do, first, I didn't want the books to be confused as "just another coloring book in a vast sea of coloring books" and second, (and more important) I wanted them to be exactly right. Also, while the series ARE books which you color, they are FAR MORE than just "coloring books". They are learning books. Relaxing books. A way to make learning the nuances of quartz crystal easy, fun, and memorable. There is something magical about opening the right-brain, or creative side, that helps to bring the logical, or linear, left-brain side into more clear focus. This is what I hope to achieve with this series of books. This week we're going to discuss Lemurian Seed crystals. They sometimes are similar in shape to Laser Wands, and indeed, some Lemurian Seed crystals ARE Laser Wands. As a reminder of what Laser Wands here, follow this link to a post on that subject. 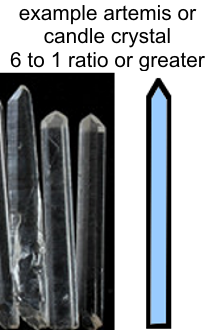 Though Lemurian Seed crystals are sometimes in the shape of Laser wands, (a thicker base which tapers to a very small terminating end) they do differ in a few very different ways, both physically and energetically. Energetically, Laser Wands typically have a laser-type focus, whereas Lemurian Seed crystals have a feeling of connection, love, star travel and a vast opening. We'll get to the other differences a little later in the post. Lemurian Seed crystals are reputed to have been "seeded" (aka planted) by the wisdom keepers in ancient Lemuria, before they left planet when their civilization on Earth was no longer viable and coming to an end. Lemurian Seed crystals are said to have been encoded with information to help guide us, by imparting the Lemurian's attitude of love, peace, enlightenment and conscious connection. This week we're going to talk about Artemis or Candle crystals, which are long thin points with a 6 to 1 ratio (for example: 1 inch wide and 6 inches long, or 1/2 inch wide and 3 inches long, ETC). This is a potentially confusing topic, so I hope this post helps clarify rather than muddy the water. ENHYDRO CRYSTALS - Forbidden Knowledge, Excited Possibility, Magic! This week we're going to revisit Enhydro crystals. I LOVE Enhydro crystals! There are many different thoughts about the properties of Enhydro quartz but they mostly boil down to knowledge, possibility and magic. We'll get to that later in the post. First, let's talk about what they are. Enhydros are crystals with fluid inside them. The only way to know for CERTAIN if you have an Enhydro (if there is water or fluid present) is if there is something IN the fluid. This is most usually an air bubble, I suppose it could also be sediment of some kind, but most usually it is air. This week we're going to discuss Left and Right Activation Windows in crystals. To review what we discussed last week, a Window crystal is a crystal with an extra facet. To determine if you have a window, you count the faces.